Soothe and Hydrate with Nourishing PURE Papaya Skin Food. 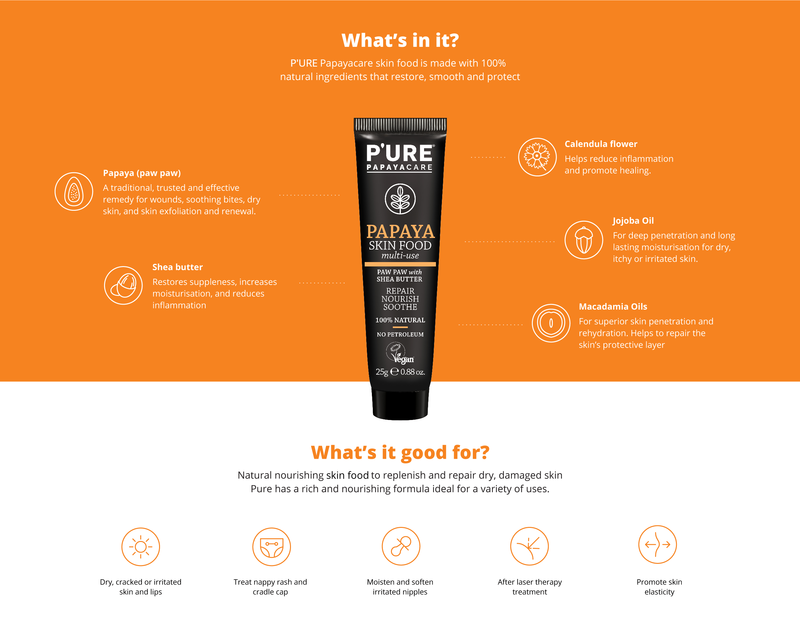 PURE’s Papaya Skin Food provides instant nourishment to dry, cracked or irritated skin and lips. This multi-use balm is ultra-rich and works to soothe, restore and protect your skin naturally. 100% natural formula combining Australian Papaya, Shea butter and Australian macadamia oil. How to use PURE Papaya Skin Food – apply topically as required and remember that a little but goes a long way. As you are buying a truly natural product, Pure Papaya Skin Food may harden in cold temperatures. If so warm tube in hands before opening. Keep out of direct sunlight as product becomes softer at higher temperatures. STORE BELOW 30 degrees celsius.